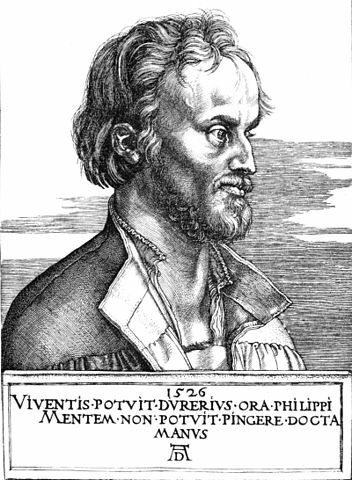 An engraving of Philip Melanchthon done by Albrecht Dürer. The Apology of the Augsburg Confession is a confessional document of the Lutheran Church written at an extremely critical point in the history of Lutheranism. The very existence of the Lutheran Church was at stake at that time. To understand the nature of the Apology and how it came about we need to go back to the story of the Augsburg Confession. The public reading of the Augsburg Confession at the Diet of Augsburg, Germany, on June 25, 1530, had significant consequences. Many representatives of German territories and cities now became aware that the Lutherans had been slandered and their teachings misrepresented. Many of them now even expressed openly their adherence to the Reformation. The Emperor Charles V then appointed a group of Roman Catholic theologians to prepare an answer—a confutation—to the Augsburg Confession that would refute conclusively the Lutheran position as stated in their confession of faith. A text prepared by this group, comprised of some of Luther’s fiercest opponents, had to be revised before it was considered acceptable by the emperor and the German bishops, princes and estates. On August 3, 1530, the Imperial secretary read the Roman Confutation, written in the name of the Emperor, in the same hall in which the Augsburg Confession had been read thirty-eight days before. The Lutherans were not given a copy of the Confutation. When they persisted in their request for a copy, the emperor agreed to grant it to them under the condition they would not respond to it in print. The emperor demanded the Lutherans accept the Confutation. This meant they would have to give up their confession of faith and return to the teachings and practices of the Roman Catholic Church. The Lutherans were willing to go a long way for the sake of peace, but they were not willing to act against the Gospel and their conscience. Many now feared war was inevitable. It actually came about, but much later, in 1547. The Lutherans felt they had to defend their confession of faith and show the Confutation had not disproved their doctrine on the basis of Scripture. But, how could they do this without a copy of the Confutation? During the public reading of the Confutation, some of the Lutherans had written down as much as possible of its main points of argumentation. On the basis of these notes, Phillip Melanchthon and others prepared a first draft of the Apology (defense) of the Augsburg Confession which they had finished by September 20, 1530. Two days later, the Apology was presented to the emperor but he refused to accept it. The Lutherans were then given until April 15, 1531, to consider whether they would return to the Roman Catholic Church. After the end of the Diet of Augsburg, Melanchthon continued working on the Apology even while on his way back to Wittenberg. He worked on it intensively and without interruption improving it and expanding some of its articles especially the one on justification. As one story has it, once while he was writing during the meal on a Sunday, Luther took the pen from his hand and told him God could be honoured not only by work but also by rest and recreation. Melanchthon, originally intended to make only some additions to the original draft. But as he worked on it the text grew larger. Then, in late October, someone sent him a copy of the Confutation. This enabled him to do a better job answering it. The completion of the work’s revision took him much longer than he had initially anticipated and, thus, the publication of the Apology occurred at the end of April or early May 1531. Melanchthon wrote the Apology in Latin. A German translation, by Justus Jonas with Melanchthon’s assistance, appeared six months after the first publication. This was not simply a translation but a new version. The alterations of the original Latin seem to stem from Melanchthon rather than from Jonas. Melanchthon, meanwhile, had prepared a second edition of the Apology which was published in September 1531. The German translation was partly based on this so-called octavo edition, because of its format. Luther seems to have been more pleased with this second Latin edition of the Apology than with its first edition. The Apology is both a refutation of the Confutation and a defense of the Augsburg Confession. It elaborates on several of the articles of the Augsburg Confession but it is the article on justification which receives the most thorough and extensive treatment. The doctrine of justification—the first and chief article of our faith, on which stands all that the Lutheran Church teaches—is not only treated most extensively in one article of the Apology but also forms the basis for all the other articles and sets the perspective from which they were written and are to be understood. The truth it embodies and proclaims—that sinners obtain the remission of sins for Christ’s sake, by grace through faith—is what, above all, makes the Apology still relevant and meaningful for Lutherans and non-Lutherans. That is the clear voice of the Gospel brought again to full light in the 16th century and that never grows old or outdated. The Apology in spite of its substantial theological content is not a treatise of abstract theories but is aimed at the believing, teaching and confessing of the Good News, that Jesus Christ is our Lord and Saviour. You can read an older translation of the Apology of the Augsburg Confession online here for free. For an up to date translation that’s easy to read, check out The Book of Concord – A Reader’s Edition from Concordia Publishing House.